Last week a crazy thing happened. It was Thursday, late afternoon. I was taking a break from work and cruising Twitter, cup of hot cocoa in hand. 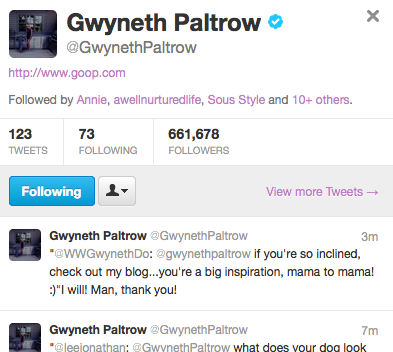 I noticed that Gwyneth Paltrow was hammering out Tweets in rapid succession. Now you have to understand, I certainly admire her but this is not a Gwyneth Paltrow fan site and I have really never given much thought to her Twitter activity, with the exception of the odd thing I may RT from her or GOOP. But suddenly I decided that it would be really cool, in that moment, if she knew my blog existed. If she took a moment to check it out. If maybe she even liked it, mama to mama. So I Tweeted at her. And went back to my inbox. And then I started screaming at skater hubs. And then I started screaming on the phone to my sister. And then I told my entire virtual world via Facebook and Twitter. And then the numbers on the blog started growing. And growing. Every time I went back to refresh, they grew some more. Now I am not one to share stats, this blog is about creativity and fun for me, not about readership and sponsors, and I am sure mine are nothing compared to most (which is fine with me) but I can tell you, it was beyond exciting to imagine all these people, many seemingly from around the world, tuning into my little channel for a minute…or five…or ten. And it has made a difference ever since. It has infused me with a brand new energy for my site, my voice, my opinion, my style. It has given me a new personal goal when it comes to readership, Tweets, and now “Likes” on Facebook (just started today, go Like it!) which isn’t necessarily about numbers, but about sharing. And hopefully, it has given you a new site to bookmark and enjoy. Love this all. That’s all.